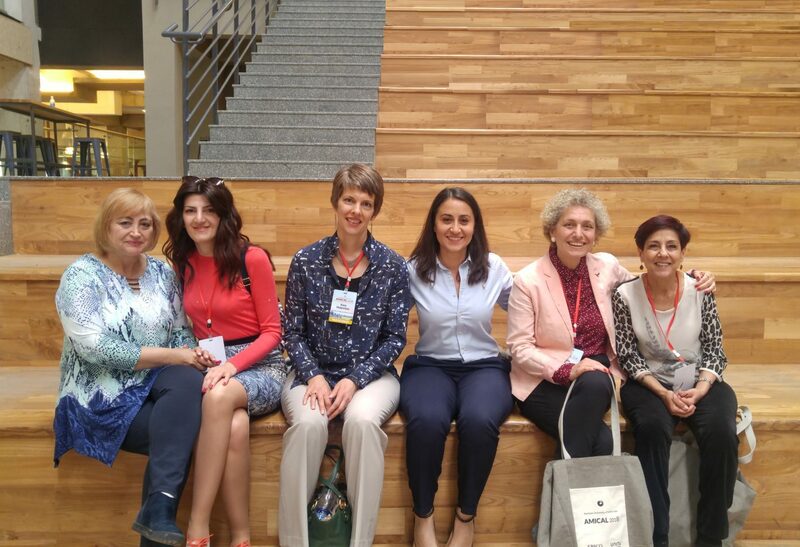 BISHKEK, Kyrgyzstan ‒ From May 4 to 7, 2018, three representatives of the American University of Armenia (AUA), Satenik Avakian, AGBU Papazian Library Director and the AMICAL representative at AUA, Tatevik Zargaryan, e-Services and e-Resources Librarian at AGBU Papazian Library, and Astghik Ghevondyan, Associate Director for Applications and Data at AUA Information and Communication Technologies Services (ICTS) Department, attended the AMICAL 2018 conference. The 15th annual conference of the AMICAL consortium, which aims to promote libraries, technology and learning at American universities worldwide, was hosted by the American University of Central Asia (AUCA) in Bishkek. The AMICAL 2018 conference, themed “International liberal arts in a digital era: Reimagining a shared vision for libraries, technology and learning,” focused on a wide range of topics related to library, faculty, and IT collaboration. It featured preconference tutorials, panel presentations, keynote speeches, as well as birds-of-a-feather sessions. Avakian had a panel presentation on “New learning spaces: Transforming the way we teach, learn and research.” She presented AUA’s AGBU Papazian library facilities and learning spaces across the university, including the ones that will open this June. “The conference offered us a great opportunity to interact with colleagues, to discuss shared problems and solutions, and to hear from exceptional practitioners,” Avakian remarked. Zargaryan’s panel presentation was titled “Beyond Co-design! Next steps for ACRL Framework collaboration.” She introduced librarians’ perspective on co-designed courses with updated data from the Paris workshop held at the American University of Paris (AUP) in 2017. The conference was organized with funding from a 1.1 million dollar grant endowed to AUP by the Andrew W. Mellon Foundation to build leadership and capacity for digital liberal arts across AMICAL consortium of 27 American-style liberal arts institutions. The grant funds will also be allocated to improving virtual collaboration platforms, organizing strategic professional development events, as well as supporting AMICAL members to initiate goal-related projects and other capacity-building programs among member institutions.